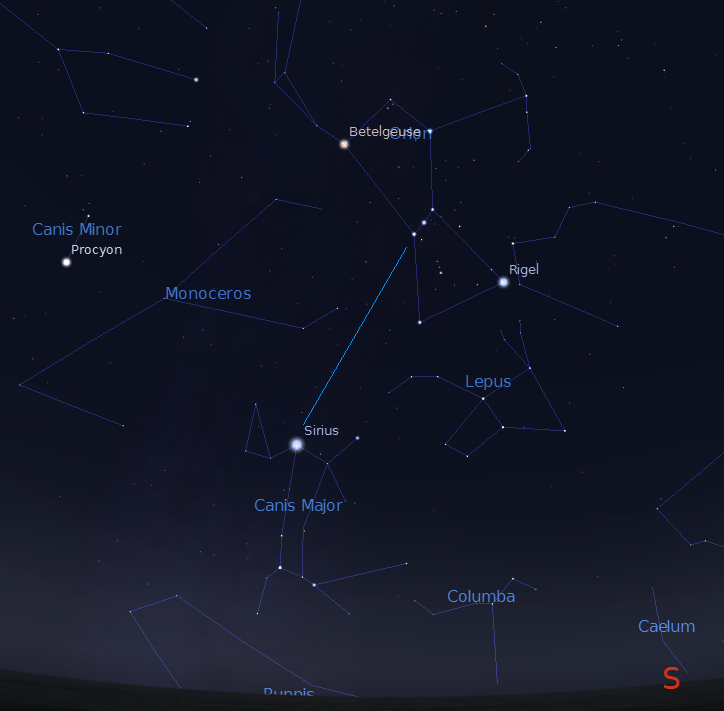 02/07/2019 – Ephemeris – Siriusly, folks. 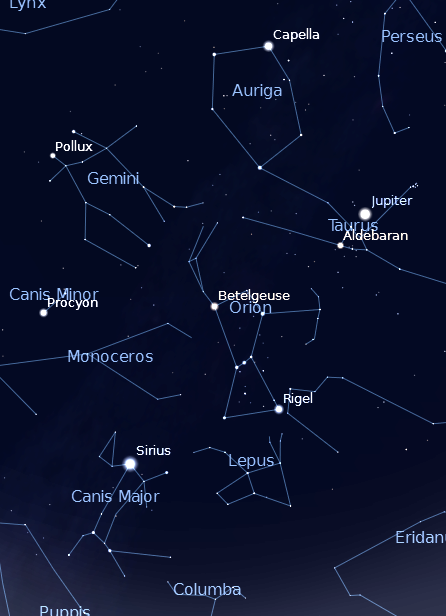 At 9 in the evening the great constellation of Orion the hunter can be seen in the south. Its large rectangle of bright stars is now upright, while in the center is a row of three stars, his belt. These stars tilt downward to the left to a very bright star merrily twinkling in the south-southeast. This star is called Sirius, also known as the Dog Star because it’s in the heart of Orion’s larger hunting dog, Canis Major. It is an arc light white star as seen in binoculars or telescope. It’s a neighboring star, just twice the distance of the closest star to the sun at 8.6 light years. It’s name, Sirius, has nothing to do with a dog, but is from the Greek meaning scorching for its brightness or sparkling, due to its intense twinkling. Ephemeris for Monday, January 25th. The Sun will rise at 8:09. It’ll be up for 9 hours and 31 minutes, setting at 5:41. The Moon, 2 days past full, will rise at 7:43 this evening. While we’re waiting for the bright Moon to leave the evening sky, let’s look at another bright star. This one is the brightest of all, Sirius the Dog Star. The Dog Star name comes from its position at the heart of the constellation Canis Major, the great dog of Orion the hunter. The three stars of Orion’s belt tilt to the southeast and point to Sirius. The name Sirius means ‘Dazzling One’, a reference to its great brilliance and twinkling. The Romans thought Sirius added its heat to that of the Sun in summer to bring on the scorching Dog Days of July and August. Its ancient Egyptian name was Sothis, and its first appearance in the morning twilight in late June signaled the flooding of the Nile, and the beginning of the Egyptian agricultural year. Ephemeris for Tuesday, January 22nd. The sun will rise at 8:10. It’ll be up for 9 hours and 27 minutes, setting at 5:37. The moon, half way from first quarter to full, will set at 5:23 tomorrow morning. The brightest star-like object in the evening sky is Jupiter high in the sky now. The second brightest star-like object is Sirius, also known as the Dog Star. It also is the brightest night-time star in our skies period. Tonight at 9 p.m. it’s located low in the southeastern sky. The Dog Star name comes from its position at the heart of the constellation Canis Major, the great dog of Orion the hunter. The three stars of Orion’s belt tilt to the southeast and point to Sirius. The name Sirius means ‘Dazzling One’ or ‘Scorcher’, a reference to its great brilliance and twinkling. Its Egyptian name was Sothis, and its appearance in the dawn skies in late June signaled the flooding of the Nile, and the beginning of the Egyptian agricultural year. Winter Circle and Jupiter with Sirius at the bottom. Created using Stellarium. Tuesday, December 20th. The sun will rise at 8:15. It’ll be up for 8 hours and 48 minutes, setting at 5:04. The moon, 3 days past last quarter, will rise at 4:45 tomorrow morning. * Times, as always are for the Traverse City/Interlochen area of Michigan. Text in brackets was omitted in the audio program due to time constraints. The grid lines are right ascension and declination, analogous to longitude and latitude on the earth. Looking eastward the right ascension lined run from the upper left to the lower right. Thus Procyon is definitely farther east than Sirius.